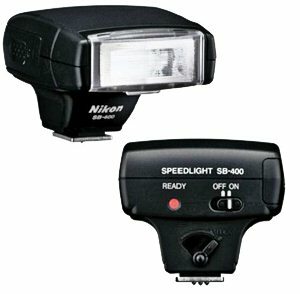 The Nikon SB-400 Speedlight flash gun is a no-nonsense flash with no bells or whistles. It allows you to focus on taking pictures instead of all the features you never use anyway. It’s small, modern, really light and compatible with most DSLR’s made after 2004. It costs over $100 in most places but it’s worth it since it’s really well-built and lasts forever. It’s best used in bounce mode and needs much less power when aimed forward, making your batteries last longer. The bounce on this flash makes it worth buying singlehandedly. Just flip it facing up and bounce the light off the ceiling for great, softly, naturally-lit shots. It’s super small, has performance rivaling the top flashes from Canon and uses two AA batteries which last forever. A small downer is that there is no sideways tilt option on this flash. You can either tape a small mirror onto it or build your own soft box and that does a great job. The Nikon SB-400 Speedlight flash gun does exactly what you want which is provide excellent exposure. It has no manual exposure mode though, and only works in the i-TTL mode. This means you can’t use it as a trigger for studio strobes. It has slow sync, rear curtain and red-eye sync. The recycle time is rated at 4s with alkaline or lithium and 2.5s with Ni-MH and 3s with Panasonic Oxyride. It comes with a nice, padded and zippered case to keep it safe too. The exposures with this flash are dead-on and can handle almost any situation perfectly. It has a great, locking metal hot-shoe too with a metal locking bolt to prevent it from sliding off. Since the hot shoe is made of metal, it will never wear out either. It uses standard old alkaline batteries so the convenience level is very high. You can get them at just about any store in the world so you’ll always have a working flash. The standby mode is great in that it turns on and off with the camera. The sheer simplicity of this flash is it’s biggest strong point. You just attach it to your camera, turn it on and viola, you can start taking photos. No need to mess with settings or anything else. If you’re looking for a Nikon flash for indoor shooting then the Nikon SB-400 Speedlight flash gun has got to be on the top of your list.